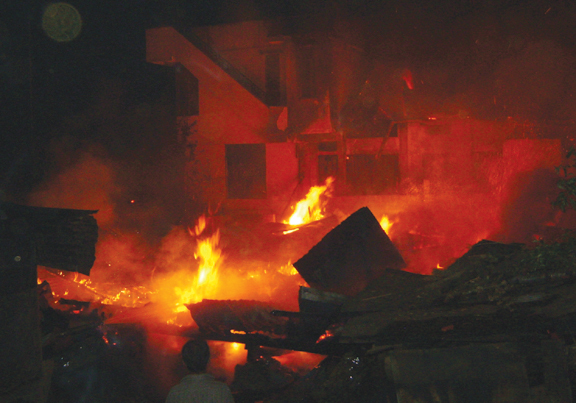 SHILLONG: A devastating fire gutted four Assam-type houses completely at Mawlai Mawroh on Monday evening. However, there was no report of any casualty. According to the owner of the four houses, which were rented out to tenants, B Nongrum properties worth Rs 10 lakh were reduced to ashes in the fire. A nine-year-old boy, who was sitting with his other sibling, ran out of his house after hearing a noise on the rooftop. The fire broke out due to electric short circuit and gutted the other houses after a cylinder exploded in the impact of the fire. Destruction would have been far reaching had a teenager Bajop Pyngrope from Upper Laban, who went to Mawlai Mawroh with his friends, not brought out other cylinders from the remaining three houses. He also informed 108 service. Meanwhile, the residents of the area alleged that the Fire Brigade arrived when all the housed were reduced to ashes. Interestingly, an unclaimed suitcase was also found near a church, five km away from the incident site. The bomb squad later took the suitcase to Mawiong.